﻿ Measuring Email Marketing Success: Opens vs. Clicks » Red Mango Marketing! When it comes to email marketing, standing out from the crowd is a good thing. You are fighting off way more brands than you can even imagine just to get into the coveted inbox space of your contacts. To get an idea of what we’re up against: Email marketers of the world send out 196 million emails every day. And of those 196 million, only about 20 percent actually get opened. With odds like that, how do you know if your email campaigns are working? As a small business owner or nonprofit, you’re dealing with a number of subscribers to whom you send multiple emails a week. If they open your email, does that mean they read it? What made them want to open it? Will they engage with you further or do they not care at all? These are all important questions to ask in order to make sure you are getting the most out of your email marketing. At the start of every new email marketing campaign, it is extremely important to figure out what the goal of your campaign is. You need to have certain metrics in place which allow you to check if your email is being well-received by your customers, or if they’re not happy with the content you’re sending out. You should be tracking these metrics for every email campaign you send. In the email marketing industry, there are two predominant measures of performance – open rate and click-through rate. If you are going to measure anything, measure these. As the name suggests, the email open rate simply is the number of people who have opened your email. And not the ones who just click on the email and immediately close it. Open rate is measured when someone views your email marketing campaign, waits for the images to load, and then closes the email. Open rate is calculated by dividing the number of unique opens by the number of emails sent, excluding the number of bounces. There’s also the concept of ‘unique opens’ which is defined as the number of the distinct recipients that have opened your campaign. Putting it simply, for each recipient that has opened your campaign, only one open is added to the unique opens sum, no matter how many times the recipient has opened and reopened the email they received. Tip: So what is a “good” open rate? Constant Contact provides industry-specific data on open rates based on the millions of emails they send each year on behalf of their clients. It is extremely important to measure open rate because it tells you how many of your subscribers have checked out your email. You can also track to see how many times a particular email has been opened by each user, and if any of them clicked the links in that email. This takes us to our next email marketing metric. A customer has opened your email, read your content and scrolled to the bottom where your “call-to-action”, or CTA, is starting them in the face – Do they click, or not? Your click-through rate determines whether people have interacted with you via the email they received. Not only can you see which links were clicked, but you can track who clicked on a link and when. This is extremely valuable information when learning what content resonates with your audience the most. The click-through rate is the percentage of click-throughs for a particular email based on the number of contacts who actually opened the email. The click-through distribution total is merely the total of all clicks for that campaign – which is always 100%. The average across industries for click-through rate is around 7%. Constant Contact customers see average click-through rates ranging from 7% to 27%. Not yet a Constant Contact customer? Try it free for 60 days! A higher click-through rate means a good email campaign. A lower click-through rate doesn’t necessarily mean your campaign isn’t great, but that minor adjustments are needed. Remember, the average click-through rate also depends on your industry, the number of emails you send, the kind of emails you send and who your target audience is. Analyze the results from previous campaigns and figure if there’s anything you can emulate to improve current click-through rates. Make sure that your content is compelling enough for people to click to learn more. What do these metrics mean for your email performance? Click-through rates show an email’s overall performance while open rates reflect the success of your email standing out in your contacts’ inboxes. Knowing what’s working and what isn’t will save you time, effort, and money in the long run. So get excited about sending emails that will get your subscribers excited! With these metrics to guide your way, it will be easier than you ever thought possible. 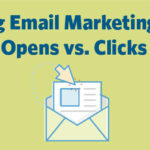 The post Measuring Email Marketing Success: Opens vs. Clicks appeared first on Constant Contact Blogs. This entry was posted on Monday, October 1st, 2018 at 8:48 am	and is filed under click-through rate, Email Marketing, News & Updates. You can follow any responses to this entry through the RSS 2.0 feed. Both comments and pings are currently closed.